Yesterday morning, Cleo woke Benjamin up by throwing up on the bed. She managed to hit the quilt, the comforter, and both blankets. Was this her way of telling us that the bedding needed washing? I was once awakened in the middle of the night by our cat Duchess eating a dead rodent on my bed. She brought it to me because she liked me and my room was her favorite place. Ah, the joy of having cats. We took advantage of the nice morning to go for a bike ride - only about 7 miles this time. The sun was a bit deceptive, masking the vicious headwind that made the outbound trip a hard push. I really hate biking into the wind! Wildlife count: 7 ducklings with parents, 1 woodchuck, 1 woodpecker, 1 blue jay, assorted robins, swallows, starlings. a house like that some day. Over the weekend, a thawing occurred in the kitty cold war that has gripped this household since late November. Cleo, who has been the primary instigator and victim of the war, seemed to decide that she was not going to take it any longer. 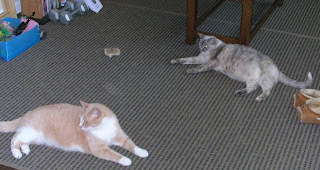 She shared a bench with Oliver (above) and the living room with Creamsicle (below). Yesterday evening she spent her time going from place to place in the living room, trying them all out to see which one was the comfiest. All of this would have been unthinkable a month ago. Hurrah! She and Oliver also ventured out into the front and back yards (chaperoned of course) several times to munch grass and do a little (very little) bit of exploring. 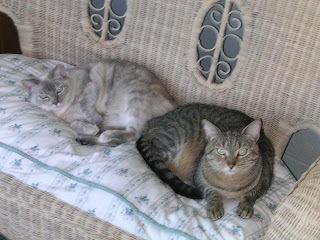 Oliver, once the all-around picked on nice-guy, now chases both CS and Cleo when he feels like it, and taunts them both. I am not sure what occasioned this change, but I am happy about it. Maybe one day they will all sleep happily together on the bed. Wait, that would mean even less room for Benjamin and I...we might have to cede the bedroom to the cats and sleep in the living room! If Plato was right, and there are forms, the ideal perfect of any object, then Saturday and Sunday were the forms of Late May weather. The sun was out, but it wasn't too strong, there was a breeze, but it wasn't troublesome. The blooming flowers and trees gave the air a soft scent. And there were ducklings! It was almost enough to make me forgive the snow in March for sticking around long after its welcome had been worn out. For the first time in a long while we were both feeling pretty good, and we took full advantage of the days. On Saturday we, along with half of Rochester it seemed, headed to the Public Market. The local Brockport Farmer's Market doesn't open up until the middle of June, and fresh local produce was somewhat scarce at the market, but we still found quite a bit to buy. On our way home I detoured to show Benjamin where I work, and in a stroke of genius, we decided to have lunch at Java's - the excellent coffee shop just next door to my office. 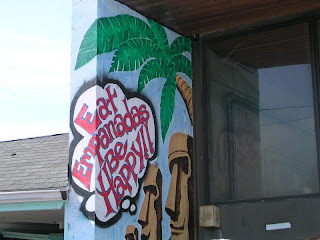 I have had their desserts, which are far too good to eat on a regular basis (if you know what I mean by good - high fat, high flavor - yum yum) but I have never had lunch there. They do sandwiches, salads and soups - we tried the first two of these and were well pleased. In the afternoon we took a long, leisurely stroll up the canal and basked in the air. Sunday we went on the first extended bike ride of the year. It wasn't all that extended - only an hour and 11 miles - but we are both still recovering from nasty colds, so that was good. We intend to go on longer rides later in the season. Again, the weather was perfect, although we could have done without the headwind on the homeward portion of the ride. 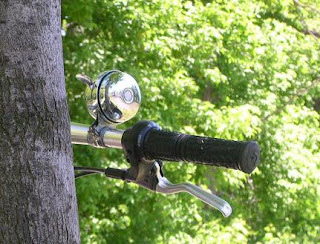 I finally got to use my bike bell - I have had it here for ages but never got it on the bike until yesterday. It is actually on the wrong side - it tilts to the left, but since I had to add duct tape to hold it still, it isn't moving. Wahoo! A long weekend is coming up. We don't have any big plans - I've never understood the desire to go on vacation at the same time as everyone else - but hopefully we will have some fun. A trip to the Rochester Public Market in search of early season fruits and vegetables, a bike ride, maybe a trip to the movies. I'd also like to spend a little time out in the garden, and cleaning the house - now that I am working, this isn't getting done as often as it should. And the Stanley Cup Finals start Saturday night, so we will be watching and cheering for the Pittsburgh Penguins. Our part of Brockport is pretty empty, now that the majority of the college students have left. We saw them packing up apartments and houses last week and the beginning of this week. It will be interesting to see if the town itself stays quiet all summer. There are a couple of festivals and such that should bring people into town, and once the weather gets nicer there should be more boaters. 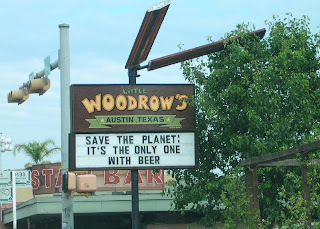 OK, time for the longer version of our trip to Austin. We left Thursday morning, and had good luck with both our flights - that is, they were both on time and we made it on to both of them. First time that has happened in quite a while. The most exciting thing that happened was the screaming lady. On the first flight, the pilot came on to give us a weather forecast and mentioned that it might be a bit bumpy, because it was cloudy and cloudy means turbulence. Apparently, someone (I later suspected the screamer) misunderstood this to mean it could be a bad flight, and he had to come back on and explain that he only meant it might be less than smooth, not that we were going to be tossed around like shake 'n bake. Well, this was a little unusual, but not really worth noting at first. But then, once the plane started to move and lift off, a woman up front started screaming: "Oh my god, I have to get off..." and so on. Her traveling companions seemed to be attempting to calm her, and the flight attendant was trying to be reassuring. The solution seemed to be to give her a Coke and a mini-bottle of vodka. I am not sure if it really helped, but at least the woman stopped screaming! Thursday evening, before I left to visit my old tai chi class, we sat around watching TV, and because there wasn't anything else on, we started watching the evening news. Now, normally, I would never watch the local evening news - too little news, too many silly stories - but once it started, we were hooked. This was because on Wednesday night there was a storm the likes Austin hadn't seen in 15 years. There were high winds, trees knocked down all over downtown, torrential rain, and most exciting (for us anyway) hail the size of baseballs raining down. The news had pictures of car windows that had holes punched all the way through the safety glass, and a story about a family that had a bolt of lightening punch a huge hole in the roof of their house. Very exciting. Little did we know the impact the storm would have on our later activities. Friday morning, after we picked up Benjamin's dad, we headed off for breakfast, intending to go to a restaurant we both liked near campus. As we drove through the Hyde Park area of town, we noticed more and more evidence of Wednesday's storm - parts of trees on the ground, leaves all over the place, at least one set of stoplights out. When we reached the restaurant, it was closed due to storm-related electrical problems. Huh. 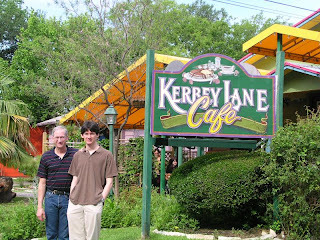 So, we ended up at Kerby Lane instead, which was a good substitute. I had strawberry pancakes - yum. The second storm-related alteration came right after breakfast. 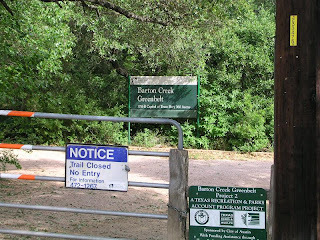 Since we had plenty of time to fill with Scott, Ben's dad, and we wanted to do something outside, we thought we would like to go for a hike on the Austin Greenbelt trail, a bit of the hill country in the middle of the city. So, we drove down to the trail head, only to find the gate to the parking lot locked, with a sign saying that the trail was closed. It seemed pretty strange to us, so we called the information number printed on the sign - closed at all entrances due to the storm. Huh. 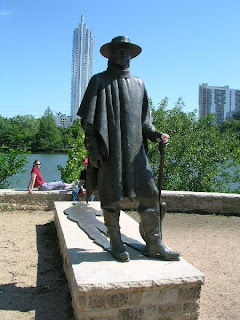 We took a walk on the Town Lake, I mean Lady Bird Lake, trail instead. Boy, we haven't even been gone a full year, and already there were 3 or 4 new sky scraper condo buildings. The rest of Friday was taken up with friends and food - and a good Friday it was. Saturday morning Benjamin and I made a trip down to the Downtown Austin Farmer's Market, just for old times sake, since we couldn't really buy much food. A pity, because there was an awful lot of good looking produce there. I did buy a small bag of fresh peaches, which I am still eating, some granola, and a really nifty t-shirt. After that, it was back to the Drew and LuAnn's to get ready for the graduation ceremony, the supposed reason for the trip. This was held in a gym at the RecSports center on campus, one of the places we used to play racquetball. 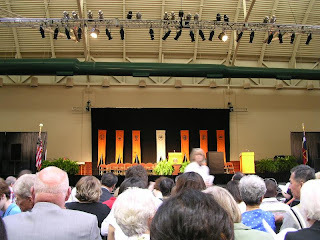 The University Masters graduation was just ending when we arrived, so those of us there for the Doctoral graduation couldn't get into the gym - we had to mill around in the heat, waiting, for about 30 minutes. 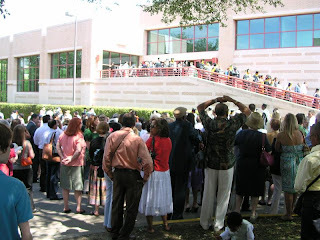 Then, in a marvelous display of bad planning, the Masters graduates and their audience came out of the doors and poured into the waiting crowd. As soon as the graduates were done coming out, the crowd surged forward trying to get in. Some sort of staff person tried to reassure the crowd that we could get in soon and then motioned towards the doors, or at least, I think that is what he was doing, because he was so far away, and didn't have a microphone so only the first row of people could hear him. In any event the crowd moved closer to the steps, and then stopped. More waiting, and then we were finally allowed in to the gym, to fight for the best seats. The ceremony itself was fairly standard - a speech by the Dean of Graduate Studies, a few awards, and then the awarding of the degrees. 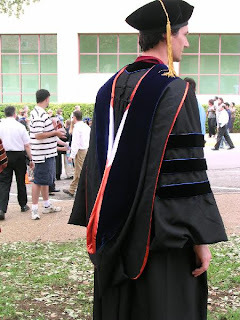 In the case of doctoral graduates, they get hooded. When their name was read out, the graduate would walk across the stage, hand their hood to an official, who would had it to a man or woman (depending on which department was being announced) standing on a box would take the hood and place it over the head of the graduate. The graduate was then turned to face the cameraman standing to one side of the stage. After the picture the graduate was quickly shuffled off the stage and the next graduate would proceed. And so on, for an hour. Who knew the University of Texas awarded 800 doctoral degrees a year!? One last disappointment/change of plans for the trip was the discovery that the restaurant we wanted to go to on Saturday night for our celebration dinner had closed. There was another location, but it was farther away than we wanted to go, so we had to go elsewhere. Sigh - you go away for 10 months, and everything changes! The final incident of the trip was all my fault. The rental car company had given us a large ring of keys, with three actual car keys and two of those electronic button keys that lock and unlock the doors. Now, this was a very large thing to carry around, and I don't think I was supposed to have all those keys anyway, so I decided to try to get some of the keys off. The problem was that the ring they were on was a solid cable sort of thing, not a normal key ring. I tried to unscrew the node that closed the ring, I tried to pull it apart...which broke it. Oops. Not a problem, I thought, I will just use the keys I need for now, and put them all back on the ring and tape it or something before we turn the car in. This worked fine for the driving around town part of that idea, but not so well for the putting them all back together and turning them in part. We had to leave really early - 4:30 AM - on Sunday. It was dark, and I was perhaps not as alert as I should have been. On the way out the door to the car, while carrying the various keys in my hand, I heard a clink and rustle - like that of a key falling out of my hand, hitting the sidewalk, and bouncing into the bushes. Big oops. We then spent the next 20 minutes on our hands and knees, with a borrowed flashlight, searching the very scratchy bushes for a dark key in the dark. Eventually, we had to give up and accept whatever consequences the rental car company imposes so that we could make it to the airport in time for our flight. Because it was so early in the morning, there wasn't an attendant at the booth, so we still don't know if there is any sort of penalty...Should have listened to my mother - when I was little she always told me not to take things apart until I got home - I should have just left well enough alone with the keys. And that is our trip to Austin, apart from the fact that we both came down with some sort of cold. It was a good trip, and we were really happy to see so many of our friends, and sad to leave again. Also, a very, very big thanks from both of us to Drew and LuAnn for letting us use their house as our base. The velvet is PhD blue, and the inside is orange and white. 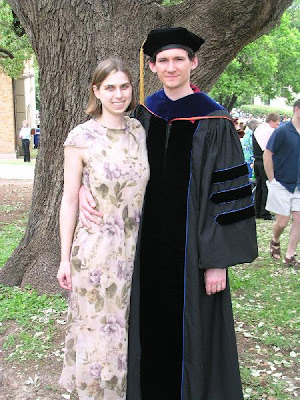 We could have ordered the University of Texas burnt orange regalia, which is all orange (alas, I don't have a picture of it here) but didn't. The picture on the ordering website was a little off-putting, although it looked nice in person. Anyway, we had a really good time - the flights all went smoothly (the first time in seemingly forever that that has been the case), we got to see friends, and eat lots of good Austin food. Benjamin's dad was there, so we had a bit of family representation as well. The weather also co-operated - not too hot, not rainy - and we missed the 15 year storm with baseball-sized hail. In all, a great trip. Tomorrow I will tell you about the screaming lady on the plane, more about the storm we missed, the farmer's market, the hooding ceremony, and the incident of the missing rental car key that had me crawling around in Drew and LuAnn's bushes at 4:30 in the morning, when we were supposed to be heading to the airport. 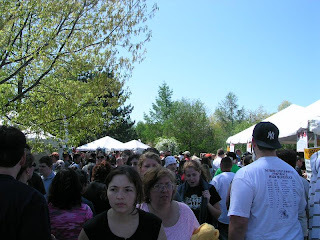 On Saturday, we were two of approximately 125,000 people (half of whom seemed to be either children in SUV-sized strollers or the parents who were wielding them) who crowded into Highland Park in Rochester for the first full day of the annual Lilac Festival. We had planned to spend time wandering the arts and crafts section, but as you can see above, it was a bit crowded... However, it was a lovely day, and all the flowers were magnificent. 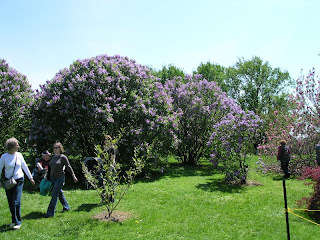 I have never seen so many lilac bushes in one place - according to the paper, there are 1200 of them! So many colors - light purple, dark purple, white, almost red... I spent more time looking at them than taking pictures, so here are the best two of the few I took (if we weren't going out of town this weekend, I would consider returning for more pictures). Check out the size of the bushes! The park also has a lot of other types of flowers and trees, and we are looking forward to returning to the park - when it is not swarming with people. If we lived in the city, I am sure we would go there often for walks. On our ride, we saw the first baby geese of the year, enjoying the lovely day, paddling on the canal. There were two sets of parents, and about 11 or 12 babies in all. Hurrah! 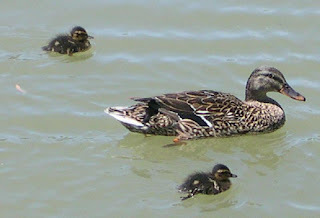 I love baby water fowl - they are so fluffy and cute. Too bad I didn't have the camera with me. There should be baby ducklings at the park soon too, I wager. We did get to the Lilac Festival on Saturday, and I have pictures, but I haven't had a chance to get them off the camera yet. I will try to get them up for you tonight. Thursday we head to Austin for Benjamin's graduation and hooding. It is Friday, once again. Benjamin has his last classes of the semester today, and there are two philosophy department BBQs this weekend. 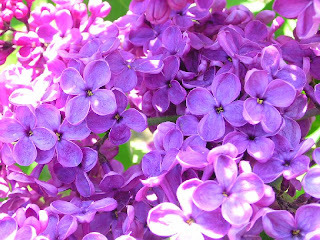 We are planning to go for our first bike ride of the year tomorrow (we could have gone a while ago, but Benjamin needed a new inner tube for a tire, and by the time he got around to fixing it, it rained every weekend...) and we are planning to go to the Rochester Lilac Festival. 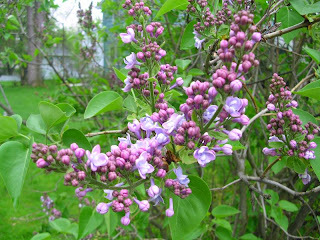 All the lilacs are blooming, just in time - apparently the really warm weather we had a couple of weeks ago, followed by more normal cooler weather was perfect for the blooms. Lilacs are one thing I will definitely miss in Arkansas...maybe I can find a version that tolerates warmer winters. The trees all have leaves now, and the lawn needs mowing. Yup, spring is here. 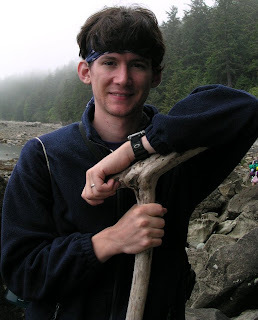 Yup, Benjamin is now 30! There will be chocolate cake for dessert tonight - wish y'all could be here to celebrate with us. Here are some pictures of the glories of spring. All except the first one are from my walk yesterday. It was a great day for picture taking - gray, so it wasn't too bright, and it had just finished raining. The only problem was the wind, which ruined a couple of shots by moving the flower just as I shot the picture. 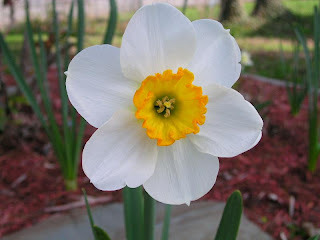 A daffodil from our front yard. I love the yellow center in the middle of the very white petals. Lilacs are starting to come out. Mmm... I love the smell! 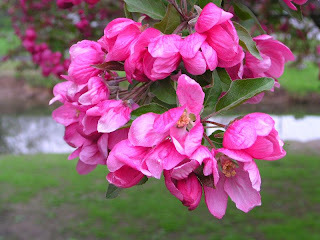 The blossoms on an ornamental tree in the park across the canal. 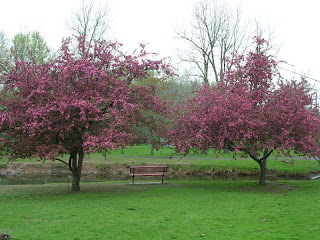 The blooming trees (see blossom pic above) at the duck pond park. 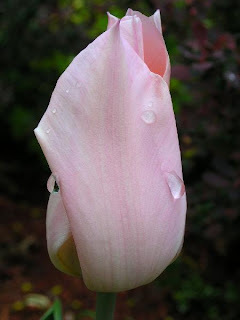 A delicate pink tulip with a raindrop.